I’m glad I decided to play this game! The only reason I started playing it was because I finished Saints Row 4 and loved it, which made me want more. As it turns out Saints Row 2 feels like it hardly belongs in the same franchise as the fourth game. Volition has truly reinvented the franchise as they’ve gone from title to title, only keeping the characters and setting as they go. This explains why the people who loved the second game and wanted more of that tend to complain loudly about the third and fourth games. They’re just not the same. Personally, I think reinventing and iterating are both equally valid approaches for a series to take. I like the variety, and you certainly can’t accuse them of retreading the same ground like I’ve seen some do with Rockstar and the GTA series. Saints Row 2 came out in 2008, and it feels like a game of its time. It might not seem like 2008 is that far back, but when you play games of that time they all feel old now, as does Saints Row 2. At that time I remember games journalists were talking about emergent gameplay instead of story, and it shows in Saints Row 2’s design. Compared to any major game released in 2013 this feels like complete chaos. Instead of the world acting like a virtual movie set with carefully staged combat, the game instead relies on world simulation systems and AI to act on its own. This approach makes it nearly impossible for a developer to tell a story during missions because the minute to minute gameplay is completely unpredictable. Instead, the designer only choreographs the action with commands like: Go there, kill that, chase that car, etc. Even during missions, the world simulation present in the free exploration mode is in full effect. So when you take over areas of the map you’ll have friendly thugs spawn there. If a mission happens to take place there, or a car chase goes through neighborhoods controlled by your gang, groups of friendly thugs will spawn and rain bullets on your pursuers. If during a mission an enemy shoots a civilian standing near you, police will arrive on the scene and start fighting the enemy gangsters with you. The last time I saw this kind of three-way combat break out spontaneously was in the Stalker games. I wish we had more games like this, especially on the next-gen consoles where the extra memory and power could allow much more elaborate world simulation. That would in some way fulfill “the point” of next-gen hardware. Making something you couldn’t do on 360/ps3, just like this game is something that couldn’t exist on PS2. Anyway, I had a great time blowing through this game. It’s messy, ugly, glitch, but it all comes together to create something special. One thing I was pleasantly surprised by was the quality of the cutscenes. In Saints Row 4 they were generally very high quality, but in a couple scenes I found the sound to be a bit crap. 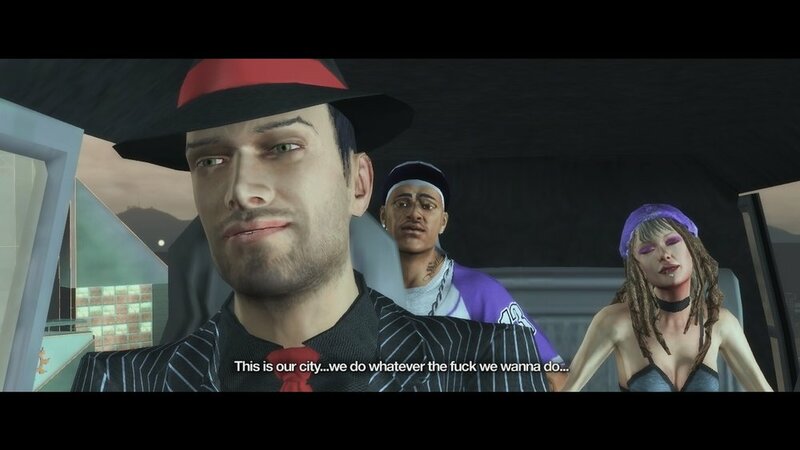 In Saints Row 2 the sound during cutscenes is phenomenal. It’s raw, violent and has about as much impact as you could hope to have. It fits perfectly with the story itself which in the “Brotherhood” missions turns into an ugly conflict where neither side appear noble or heroic in any way. It’s dark, gruesome and I was even shocked at one scene where the game made it abundantly clear that the player isn’t a hero anyone should aspire to be. So I finally get where the hype about Saints Row 2 has come from. If you know you’re a fan of slightly janky games with outstanding qualities you’ll probably like this. Those wanting a slick, modern, controlled experience should avoid it like the plague.